I've already mentioned that I'm spending the next 5 days at a quilting retreat with my bee. Have I also mentioned this retreat is at the beach? I know, lucky us. This is the first of two retreats we have planned for this fall. The purpose of this first one is mainly to work on charity quilts to be donated to Interact, a woman's shelter. There are tons of tutorials about how to make a Disappearing 9-Patch block, so I'm not going to rehash it here. If you've never made one and are interested in learning how, just do a search in Google. As I have it drawn, the quilt will finish at 59" x 74". 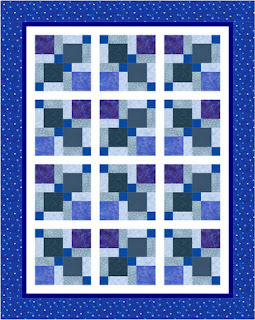 Each quilt uses 108 charm squares along with sashing, inner and outer borders. I've spent some time over the last couple of days putting together kits for it. I've made 6 kits in 3 different colorways (green, blue and purple). I'm not planning on making all of these quilts myself. Any of the ladies at retreat who'd like to make one are welcome to them. I also separated out enough charm squares for more quilts in red, orange and yellow if they'd rather do those. I just didn't have a coordinating border fabric for them (and didn't want to purchase one). It's such an easy pattern, I'm hoping I get at least 2 of the tops made. I have another quilt I want to make for a child out of different fabric. I'll have to let you know how much I actually get done when I get back.